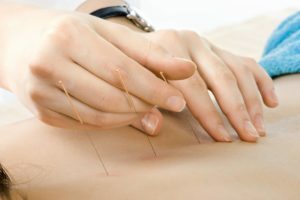 Acupuncture is the application of tiny, fine needles at the acupressure points along the meridians of the body, to stimulate and restore the circulation of Chi, or vital energy. Treatments focus on specific needs determined by an intake where pulse or tongue analysis might be utilized, and specific internal organs and physiological systems can be identified for treatment when affected in states of crisis or for preventative maintenance. An acupuncture session respects the emotional and spiritual spectrum of the the patient and so issues of mood and psychological balance can be successfully addressed as well. Chinese herbal formulas are famous for their effectiveness and, being naturally derived from plants and in some cases animal sources, provide ease of assimilation with the body. Indigenous to Chinese Medical philosophy is an understanding of five elements of nature, and the way of herbs to influence these elements in the body. Disease or disorders are seen as an imbalance of the elements and the play of Yin and Yang in a person’s lifestyle choices. Chinese herbal compendiums point a person back to wellness and the relationship to nature as constitution and as the relationship to one’s environment. Detoxification can help to relieve the body and mind of attachments to unhealthy patterns and assist in seasonal transitions with such sensitivities as allergies, migraines, gastrointestinal problems, recovery from addictions and much more. Detoxification services include acupuncture, herbal remedies, dietary regimens, and programs for specific durations where dietary modification with herbal teas may be recommended. Detoxification programs can be prescribed for 7 – 30 days, depending on the condition and aptitude of the client.